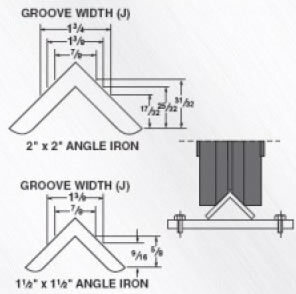 Features - V-groove wheels are highly adaptable and can operate on angle iron track or on normal floor surfaces. A relief groove at the base of the “V” equalizes the load to each face of the angle track. In addition, all wheel faces and “V” grooves are machined concentric to the bore for proper tracking. The wheel bearings are either straight roller bearings or precision tapered roller bearings. 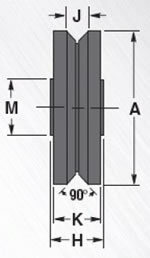 Applications - V-groove wheels are used for exceptionally heavy loads where precise alignment or indexing of equipment is necessary. These casters are capable of guiding industrial ovens, paint booths and other similar equipment. All cast iron and forged steel models are offered with plain bore or straight roller bearings while some models also offer precision tapered roller bearings for optimum capacity and performance. Stainless Steel and Plastex V-groove wheels are also available and listed in the charts below. 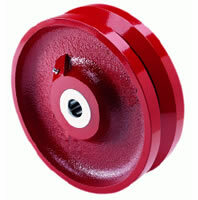 Our experienced sales staff can assist in choosing the correct caster or wheel. No online store with confusing structure and options. Quick ordering with no guesswork, get exactly what you need and order with confidence.